RUSH: Kansas City, Missouri. This is Katie. Welcome to the EIB Network. Hi. CALLER: Thank you, Rush. I’m so honored to be on with you. RUSH: Well, thank you very much. I’m glad you’re here. CALLER: Well, I was calling today to just tell you a funny story. So I’ve been listening with my kids — they are 10 and 8 — to your books. We’ve been doing audiobooks. CALLER: (laughing) He recognized your voice and he thought I was secretly listening to the Rush Revere books without them. RUSH: Well, that’s awesome. I appreciate that. I’m so happy to hear that they like the audiobooks. CALLER: They do. They really like ’em. They’ve been very interested and, you know, really interested in the history behind it, too. I’ve been pleased with that, as well, that they’re into it. RUSH: How old are they? How old are your kids that like this? CALLER: My daughter is 10 and my son is 8. RUSH: They’re 10 and 8. Well, you know what? This is… It’s interesting that they would comment on the voice, that it’s better than other audiobooks. I guess that’s because it’s a personal passion. You know, I wrote the book. It’s something that is very near and dear, but that’s quite a compliment. I really appreciate that. Thank you. RUSH: I’ll tell you what I want to do. 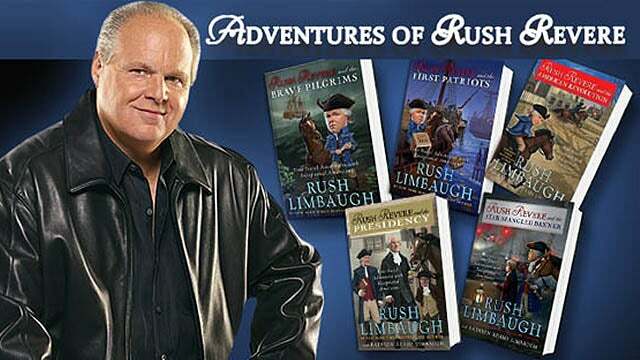 We’ve got a package of stuff from Rush Revere land we send to readers, kids your age. I’d love to put a package of stuff together. It’s a couple… You know, for your daughter we have a cute little doll of Liberty, the horse. CALLER: Wow. She would love it. RUSH: Oh, you’re more than welcome. CALLER: Completely. They will be so excited. RUSH: Well, thank you for telling me this. You know people think that, as a powerful, influential member of the media who’s supremely confident, I don’t need feedback, that I don’t care about it, that I know. But I always appreciate it, more than you know. I really do. So thank you again. CALLER: I love listening to you all day long. So, we love it. RUSH: (chuckles) Thank you. Thank you again very much. Now, don’t hang up. Somebody’s gonna pick up the phone and get an address where we can send a special package of Rush Revere goodies right out to you.